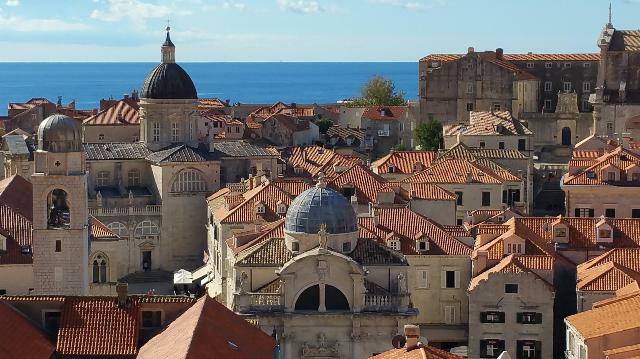 Dubrovnik is not only a great place to explore in its own right, but is a good base to discover the wines of South Dalmatia and, to a lesser extent, the rest of Croatia. While it was historically well-connected by sea, Dubrovnik’s land links with the rest of Croatia are rather tenuous as it lies almost right at the southern end of a very thin Croatian coastal strip, and nearby islands and peninsulas are more important for winegrowing than what you might call the mainland. I cannot pretend to have explored the restaurants and bars of Dubrovnik to the extent that I can point to the very best places to eat and drink, but I can add my weight to some positive reviews you will find on TripAdvisor and elsewhere: three places in the old town, and one in another town, Cavtat, readily accessible as a day trip from Dubrovnik. Firstly there is the wine bar D’Vino, which is just off the main drag in Dubrovnik. They serve platters of cheese and ham, and a good range of wines, including tasting flights. The staff are friendly and knowledgeable, and I would recommend sitting inside the building to make it easier to benefit from their knowledge and enthusiasm, as some bits of the outside seating area are a bit remote from the main action. They also run wine tours out to the Pelješac Peninsula. I had already made other arrangements for visiting Pelješac, but I think I would be more confident going with them than any of the other standard wine tours I saw advertised. We visited D’Vino twice, and the only other place we went back to was the restaurant Kopun. The name means capon, a castrated cockerel, which is their signature dish. They do however have a range of other options, and quite a decent wine list. I didn’t get into any detailed discussion about their wines, but their suggestions were confident and competent. Probably the best food-wine match of the trip was their Dubrovnik Capon with a Malvasija dubrovačka. The restaurant is one of two in the square in front of the Jesuit church, which you can actually see in the top-right corner of the image above at the top of a flight of stairs, though the restaurants are hidden. The other restaurant in Dubrovnik that made a good impression was Lady Pi-Pi, named after their unusual statue of a woman having a pee. It is located high up in the old town, close to the wall on the North side. We walked there up many, many steps from the town centre but, after sharing a bottle of 16% Dingač, thought it safer to return by the easier route round the outside of the wall. This is a barbecue restaurant that has outside seating only, and there is no booking. So you have to be prepared to queue if necessary, and possibly get rained on. In heavy rain, the restaurant will close, possibly even while you are seated. One of the biggest attractions of the place is apparently the view over Dubovnik – if you are lucky enough to get a table with a view, that is. As we visited in October, and were prepared to share a table, we did not have long to wait. I really enjoyed eating there, but to be honest I am not sure why. The food was good, but there is a limit to how good grilled meat and chips can be. The best bit was probably the Cevapi – a local meat ball speciality. And the aforementioned Dingač hit the spot nicely too. This place is a nice break from the Dubrovnik tourist norm, and well worth considering if it sounds like your sort of thing, but personally I would not queue long for the experience. Not in Dubrovnik at all but easy to reach by bus and boat, Bugenvila in Cavtat was probably my favourite restaurant of the whole trip, certainly as far as the food was concerned – good quality ingredients, and very well prepared. I learned afterwards that the chef had worked with Heston Blumenthal. We had lunchtime set menus with matching wine flights. I must admit that I was a little disappointed that 5 of our 6 wines (3 with each of the menus) were of international grapes. I also thought it a strange that I was served a Sauvignon Blanc with a mushroom and truffle oil soup, but I approached it with an open mind and it did seem to work in a yin-yang sort of way. I still wonder though if that was the intended match, or was it an error, or just some left-over wine? More about the wines of South Dalmatia, including those briefly mentioned here, in my next post.